CINCINNATI (AP) — James Conner ran for 111 yards and a pair of touchdowns on the eve of Le’Veon Bell’s possible return, and Antonio Brown turned a short pass into a 31-yard touchdown with 10 seconds left as the Pittsburgh Steelers pulled off another improbable comeback in Cincinnati, beating the Bengals 28-21 on Sunday. Make it eight straight and counting. “We’ve been in that situation a lot, and I knew we were going to do it,” Brown said. The Steelers (3-2-1) have rallied three times in the final minute at Paul Brown Stadium to keep that streak going. After Joe Mixon’s 4-yard touchdown run with 1:18 left got the Bengals (4-2) thinking they might finally have their breakthrough, Ben Roethlisberger and the Steelers stunned them again. Roethlisberger came to the line on the decisive play and saw that the Bengals were set for an all-out blitz with no safeties to guard against a big play. He immediately thought it could be a touchdown. “When you see that look, it’s how fast can I get him the ball,” said Roethlisberger, who is 14-2 in his career at Paul Brown Stadium. Brown caught a short pass and outran the secondary for the winning score, leaving thousands of Steelers fans twirling their towels in the stands. The Steelers are 16-2 at Paul Brown Stadium during Marvin Lewis’ 16 seasons as Bengals coach, including a pair of playoff wins. They’ve seen this ending so many times before. There was a scuffle among players after Andy Dalton’s final pass fell incomplete. The Steelers have found their stride behind Conner , who became the featured back when Bell decided to hold out. He has run for more than 100 yards in each of the last two games, and his two 1-yard touchdown runs Sunday put him in the company of a pair of Steelers Hall of Famers. Conner has seven rushing touchdowns in six games, joining Franco Harris (1976) and Jerome Bettis (2004) as the only Steelers with that accomplishment. JuJu Smith-Schuster had a spectacular catch — leaping over cornerback Darqueze Dennard and taking the ball way — that set up Conner’s second touchdown. Bengals receiver Tyler Boyd had a solid game against his hometown team, catching touchdowns of 2 and 14 yards . Cincinnati linebacker Vontaze Burfict was in the middle of several dustups. He had words with Roethlisberger only 3 minutes into the game. He stepped over Conner on the running back’s first touchdown, prompting a teammate to push him away before the situation could escalate. Burfict also hit Brown in the head — he wasn’t penalized — after a catch, causing the receiver to leave for a couple of plays. 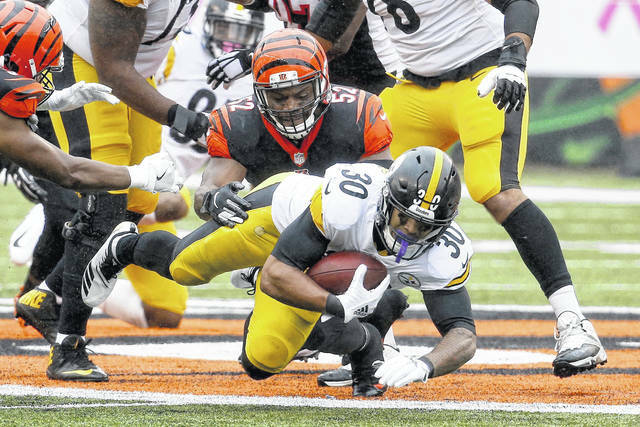 Burfict’s hit to Brown’s head helped the Steelers rally for an 18-16 playoff win in 2015. Burfict yelled at a reporter in the locker room after the game for asking a teammate about the hit on Brown’s head. “A nasty hit,” Brown said. Steelers linebacker Ryan Shazier returned to the stadium where he suffered a spinal injury last December. He’s been on the sideline for games. His return to Paul Brown Stadium was emotional for all the Steelers. “Seeing him walking off the field and walking off with him was special,” Roethlisberger said. Bengals: RB Giovani Bernard missed a second straight game with a knee injury. LB Nick Vigil left with an injured left knee in the first quarter. Dennard hurt his right shoulder on Smith-Schuster’s catch and didn’t return. S Shawn Williams left in the second half with a concussion. Steelers: Have their bye week. Bengals: Play Sunday night at Kansas City. The Bengals are 0-5 on Sunday night since 2011.